In the USA, one of the traditional Christmas practices we still like to observe is hanging around our homes wreaths made with real or artificial evergreen branches which are decorated with bows, leaves, flowers, fruits, nuts and other ornaments. 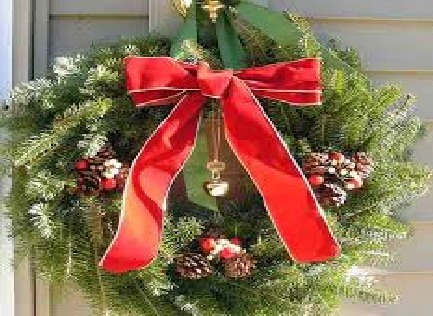 The places where we commonly hang such wreaths are on the doors, walls and over fireplaces. Usually, wreaths can be found outdoors hung on the front entrance of homes, shops, offices and street corners as part of our celebration of the season. 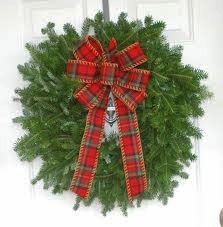 Long ago, only real holly and other evergreen branches were used in making wreaths. These days, most wreaths are made using a variety of synthetic materials. Many people now also prefer to just use store bought wreaths in their Christmas decorating. According to some historians, the origin of the Christmas wreath can be traced back to the ancient practices of the early Etruscan people when wreaths were held to be a sign of importance, success or high social standing. They were then made in the form of diadems and only the royal and upper class members of the society wore them as headbands, sometimes along with their jewelry. Other cultures followed suit with this tradition of wearing wreaths. Greeks started placing wreaths made of laurel on the heads of the athletes who won during the Olympic Games around 776 BC. Eventually, victorious military and political leaders of the Roman Empire also started wearing wreaths. Nobody really knows how wreaths transitioned from being a headgear to becoming a wall or door decoration. One likely theory is that the trend started when some winning athlete or victorious military commander decided to save and display the headgear as a souvenir of his triumph much like we do with trophies today. The tradition of using evergreen branches, whether real or artificial, as a material in wreaths began with the ancient Germanic and Celtic people who believed that they symbolize long or even eternal life. These ancient people observed Yule or Yuletide, a winter solstice festival that later became absorbed into the Christian celebration of Christmas. In the old days, the winter solstice was a time to celebrate the return of the sun, which they worshiped as a god. After the Christianization of much of Europe, the Advent wreath became another part of tradition. It is held that the Advent wreath is made of evergreens to represent everlasting life brought through Jesus Christ and its circular shape represents God, with no beginning and no end. The Advent wreath which marks the beginning of the Christian Church’s year became a standard decoration during the Christmas festivities in churches and Christian homes.